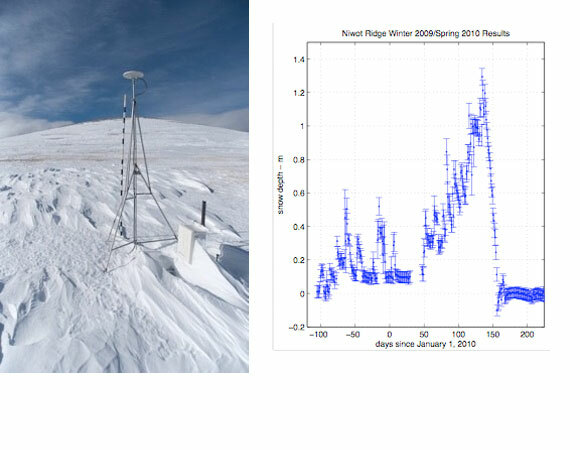 Researchers at the University of Colorado Boulder and the University Corporation for Atmospheric Research have been using what is typically considered an error in the GPS signal to measure snow depth around GPS receivers. A GPS receiver records both direct and reflected signals from a satellite. A reflected signal bounces off of whatever is around the GPS station before being recorded, and therefore can contain information about the ground surface close to the station. GPS receivers are actually designed to suppress reflected signals, because only the direct signal is needed to determine location, but Larson and her team have figured out how to exploit the recorded reflections. Traditionally snow depth has been measured by hand. In other words, someone had to go out with a measuring stick to whatever location they were interested in. One of the drawbacks is that snowy sites can be difficult to reach in the winter, and it is difficult to attain a high temporal resolution. 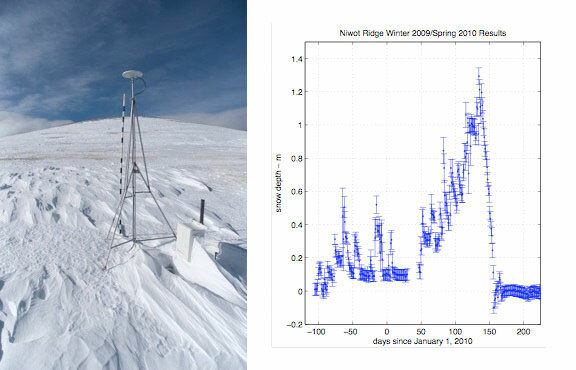 GPS snow depth measurements solve both of these problems: once a GPS unit is installed, it can function on its own throughout the winter, and will make a measurement every two hours, which is then averaged for a daily position, or in this case, snow depth. 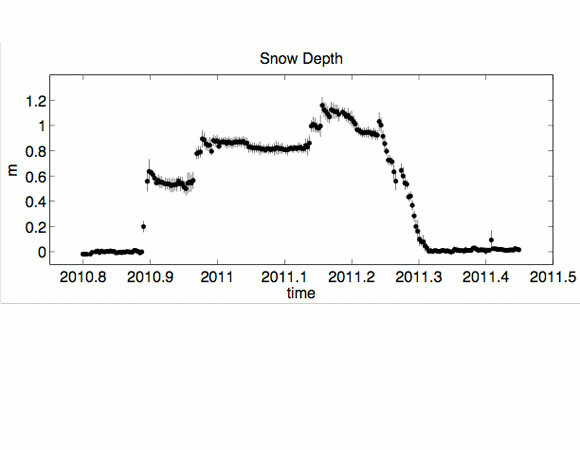 With GPS, snow depth can be measured using changes in multipath frequency, which changes based on the receiver’s height above the ground. The closer the ground surface is to the receiver, the lower the frequency of the reflected signal. Snow brings the surface closer to the receiver, so Larson can use the changing frequency of a reflected signal to observe snow depth. 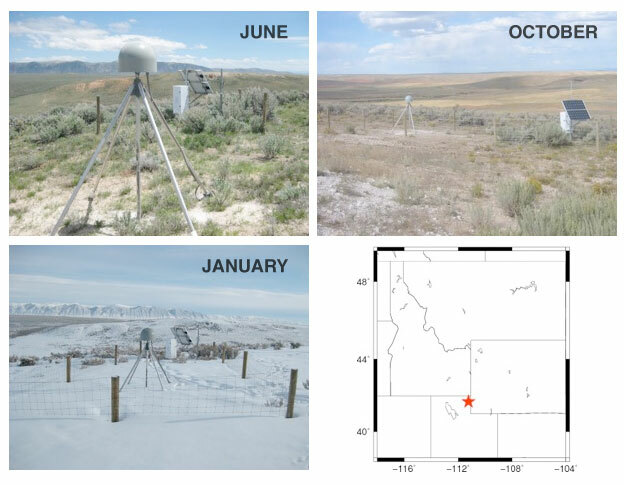 Several test sites that use other means of measuring snow depth have been operating near Boulder, Colorado, and so far the GPS results have shown excellent agreement. The team is currently producing daily snow depth estimates for 90 Plate Boundary Observatory (PBO) GPS sites. Future plans include archiving official snow depth results with UNAVCO starting in the fall of 2012. Figure 2. Changes in multipath scatter are used to estimate changes in snow depth. Figure courtesy of Kristine Larson. Figure 3. 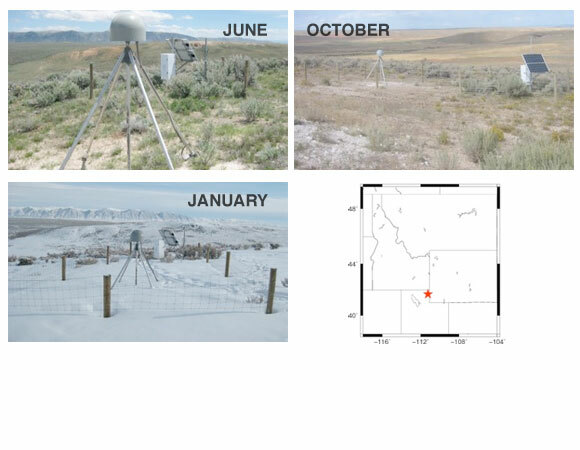 (Left) Example of GPS site for snow sensing, hosted by the Niwot Ridge Long-Term Ecological Research Site, located in Niwot, Colorado. (Right) Results for the first winter season. Figure courtesy of Kristine Larson. Larson, K.M. and F.G. Nievinski, GPS Snow Sensing: Results from the EarthScope Plate Boundary Observatory, GPS Solutions, doi:10.1007/s10291-012-0259-7.